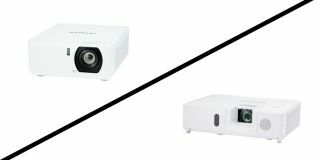 The AV industry has never backed down from a format war, protocol battle, or competing technology race, but the choice between lamp or laser projectors is a simple one with limited overlapping applications. That is according to Mike Morin, Manager, Strategic Sales Development, Hitachi America, Ltd.
Technology has been improved over the years to offer better total cost of ownership for lamp based models with lower lamp replacement cost, new hybrid filters and longer lamp life. As such, lamp-based projectors are less expensive and may be optimal where the projector is getting occasional use and is easy to access for lamp and filter replacement; these installations include classrooms, conference rooms, and mobile house of worship facilities. Other installation features that are ideal for lamp-based projectors are installations in rooms that must remain lit while using the projector.